For many refugees, education means finding a career and financial success, often never returning to the roots where they struggled as children. 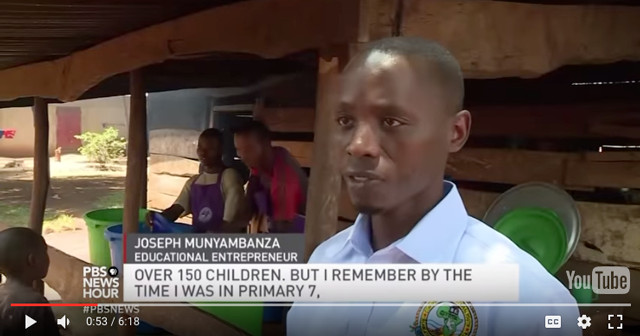 An activist for education since an early age, Joseph Munyambanza has taken a different path. Born in the Democratic Republic of Congo, he fled to Uganda at age 6 with his family. A Mastercard Foundation scholar, Joseph graduated from Westminster in 2015 and has since returned to Uganda. He was featured on Aug. 18, 2017 by PBS Newshour for his life-changing work in meeting the education needs of South Sudanese refugee children in Uganda. Watch the story above. Joseph was named Outstanding Male Student of the Year at Westminster’s 2015 commencement ceremony. He was awarded the Global Youth Citizen Award by the UN in 2017.